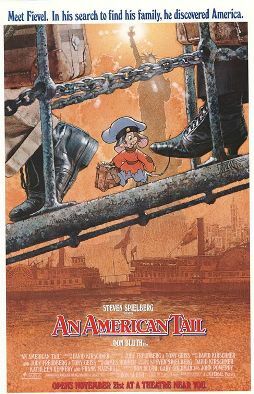 When I was a kid, I loved the movie An American Tail. I remember one day when my sister and I were out of school, and Mom and Dad were both off work, they surprised us by taking us to see it in the theater. I remember being so excited. Have you seen it? Of course you have! But, in case you’ve forgotten, it’s about a family of Russian mice who immigrate to America to escape the Bolshevik revolution, which in this case was run entirely by cats. And they were some mean cats. Mr. Mousekewitz spun tales of an America that was the promised land. An America where the streets were paved with cheese. An America that had no cats whatsoever. Tragically, on the way across the Atlantic, little Fievel Mousekewitz was washed overboard and separated from his family. He survives by floating in a bottle and washes up on Liberty Island, just shy of New York City. He then spends the remainder of the movie seeking his family and discovering that America isn’t the perfect haven that his imagination would have him believe. In fact, there are cats in America. I know, I was disappointed, too. In the end, Fievel is reunited with his family. Doesn’t it warm the heart? Plus, the movie gave us such gems as “Never Say Never,” “There Are No Cats In America,” and, of course, “Somewhere Out There.” Enjoy. ← But I Have an Account Here! Thank you for this blast from the pat reminder- I LOVED this movie! I used to sing “Somewhere Out There” a lot while working outside with horses (they didn’t judge me on my bad voice, lol.) Man, if I had the time to do so, I’d be watching this!